Let's be very careful about who we call "traitor". Edward Snowden is one of us. But today, Edward Snowden's ordeal is just beginning. A few weeks ago, Edward Snowden blew the whistle on an ongoing program -- involving the Obama administration, the intelligence community and the internet services giants -- to spy on everyone in the world. Bradley Manning's show trial enters its fourth week on Monday. After a litany of wrongs done to him, the US government is trying to convict him of "aiding the enemy." The word "traitor" has been thrown around a lot in recent days. 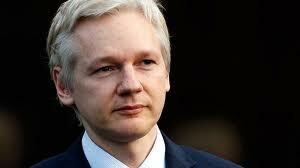 OpEdNews.com is posting for Julian Assange for the foreseeable future. The Banality of "Don't Be Evil"